The failure of Office Depot's attempt to merge with Staples sent the stock plummeting. 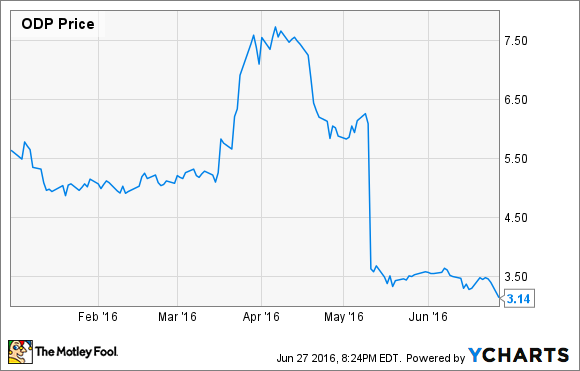 What: So far, 2016 has not been a good year for office supply retailer Office Depot (NASDAQ:ODP). It's not too hard to understand why: federal antitrust regulators succeeded in scuttling the company's planned merger with Staples (NASDAQ:SPLS) last month. Office Depot shares have lost 44% of their value since the beginning of the year, according to S&P Capital IQ data. Virtually all of the stock's decline came on the day after the Staples merger fell apart. So what: Staples had offered to buy Office Depot for a lofty $11 per share. Entering the year, Office Depot shares traded for roughly half that amount, reflecting investors' skepticism that the deal would go through. In many ways, Office Depot is worse off than it was before the merger attempt. First, it still hasn't fully integrated OfficeMax into its operations following their 2013 merger. It postponed some necessary integration activities while the Staples merger was pending. This means it isn't receiving the full benefit of that earlier merger yet. Second, Office Depot lost some market share in its commercial business due to disruption related to the planned Staples merger. Additionally, after the merger fell through, Staples announced plans to cut prices to gain share in the commercial business, with a particular emphasis on companies with 10-200 employees. Office Depot will probably be forced to cut its own prices to avoid losing customers. Office Depot may face stepped-up competition from Staples. Image source: The Motley Fool. On the plus side, Office Depot did get a $250 million breakup fee from Staples. It is using part of the proceeds to fund a $100 million share buyback. This will allow Office Depot to repurchase more than 5% of its outstanding shares. But that's a small consolation for investors. Now what: Office Depot is barely profitable: analysts expect it to post an adjusted pre-tax margin of less than 3% this year. Furthermore, it is the No. 2 player in a declining industry. So while the stock is relatively cheap, it is also extremely risky. The stock's performance in the coming years will depend on how Office Depot tries to position itself to remain relevant and how far it can reduce its cost structure. Until management provides more clarity on those issues, investors may want to keep their distance.